Like many other Shi'a militias, this group defines itself as part of the Hashd Sha'abi Committee (hence the inscription on the top right). The poster reads: "Martyrs are the leaders of the people of Paradise. 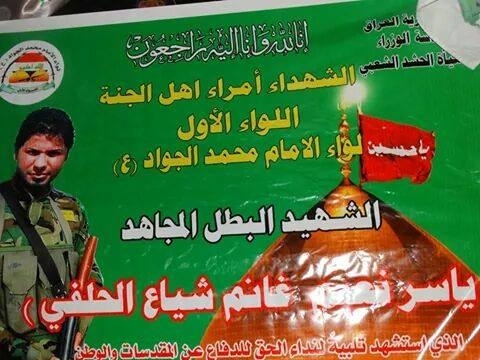 The First Brigade Liwa al-Imam Muhammad al-Jawad: the heroic mujahid martyr Yasir al-Helfi who was martyred responding to the call of Truth to defend the holy sites and homeland."